Part 2 - How to fetch data from the database using angularjs in MVC4 application. How to implement Custom Paging and sorting in webgrid using jquery. 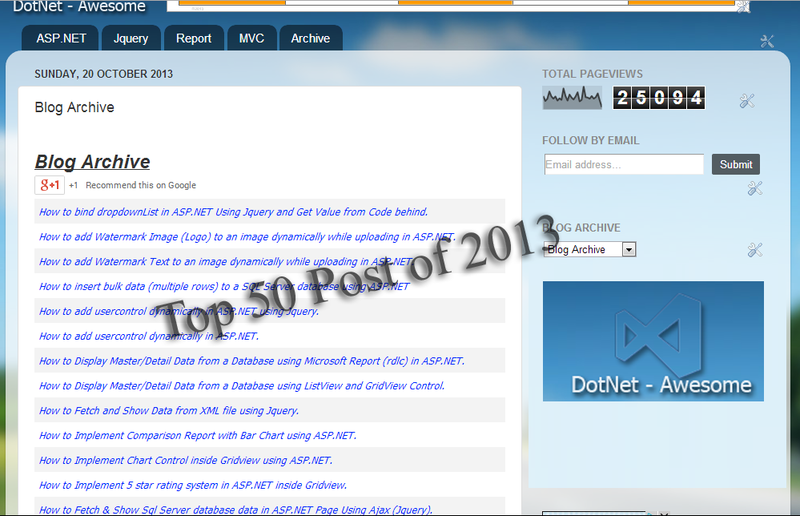 How to create Google column chart with animation on load using ASP.NET MVC4 & Jquery. How to create multilingual website in asp.net mvc4. How to insert multiple row to database using asp.net MVC4. How to insert data into sql server databse using jquery with Preventing CSRF Attacks in asp.net MVC 4 Application. How to implement Custom user defined At Least One required Validation rules in MVC 4 application. How to Export Webgrid to PDF in MVC4 Application. How to implement Custom user defined Age Range Validation / Data Annotations rules in MVC 4 application. How to Export Webgrid to Excel in MVC4 Application. Selecting / Deselecting all CheckBoxes inside a Webgrid in asp.net MVC4 Application. How to Create Nested WebGrid with Expand/Collapse in ASP.NET MVC4. How to implement simple Captcha in ASP.Net. How to insert data into sql server databse using jquery (post method) in asp.net MVC 4 Application. How to Populate Treeview Nodes Dynamically (On Demand) using in MVC 4 application. How to create multilingual application in asp.net. How to create treeview with database data in MVC 4 application. How to implement Custom user defined Validation / Data Annotations rules in MVC 4 application. How to upload image to database and show in a Page without image handler in MVC4. Part 2: How to Dynamically set row background color in a webgrid depending on the content in MVC4. how to use google recaptcha in asp.net. How to create Feedback page with cascade dropdownlist in MVC4. How to create career page with Upload file (CV) in MVC4. How to export database data to PDF file in ASP.NET. How to implement Autocomplete textbox with image in ASP.NET WITHOUT using Webservice and AJAX autocomplete extender. How to add dynamic control and manage server side events in ASP.NET. How to Grouping List Items (option) in ASP.NET DropDownList control. How to Update bulk data (multiple rows) to a SQL Server database using ASP.NET. How to bind dropdownList in ASP.NET Using Jquery and Get Value from Code behind. How to add Watermark Image (Logo) to an image dynamically while uploading in ASP.NET. How to add Watermark Text to an image dynamically while uploading in ASP.NET. How to add usercontrol dynamically in ASP.NET using Jquery. How to add usercontrol dynamically in ASP.NET. How to Display Master/Detail Data from a Database using Microsoft Report (rdlc) in ASP.NET. How to Display Master/Detail Data from a Database using ListView and GridView Control. How to Implement Comparison Report with Bar Chart using ASP.NET. How to Implement Chart Control inside Gridview using ASP.NET. How to Implement 5 star rating system in ASP.NET inside Gridview. How to apply Databar formatting on Gridview div like Excel conditional formatting options. How to apply formatting on Gridview based on condition div like Excel conditional formatting options. How to Download multiple files as ZIP at once using ASP.NET & C#. How to upload multiple file with related parameter divke file name, size etc. to SQL Server. How to upload file with encryption and download file with decryption using asp.net c#? How to upload and download files to/from a SQL Server database? How to create an error handler and Keep error logs file in ASP.NET C#? How to Bind Treeview from database using recursion function in asp.net c#? How to read and display RSS FEED in asp.net? How to upload image and generate thumbnails dynamically from an original big image. How to insert image into database and display in Gidview without Image Handler. How to use Microsoft Report in MVC 4 With Image Fields form database. Implementing cascading DropDowndivst in GridView in ASP.NET with out Web Service, Ajax. How to encrypt query string in ASP.NET. CheckBox inside GridView and handle its events to get records based on its Checked state. Check Password Strength (podivcy) in Registration Form in a ASP.Net Appdivcation. Create partial view (Usercontrol) in MVC 4. How to update multiple row at once Using MVC 4 and EF (Entity framework). How to insert bulk data to a SQL Server database using Entity Framework in ASP.NET.